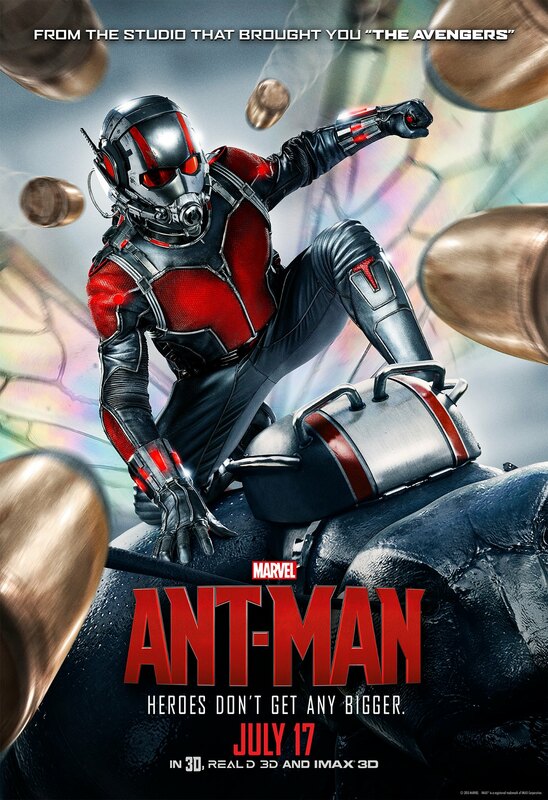 ANT-MAN is a whole lot of fun, well-directed by Peyton Reed, full of charm, great characters, and clever action. And yet, there’s a feeling of resignation behind it, and a pattern of storytelling that is starting to feel too locked down when it should be more spontaneous and free-form. ANT-MAN is a very playful movie, but watching it, you can see a few opportunities missed that would make it even more playful, even more of a joyful experience. This may turn out to be the “damning with faint praise” review that I’ve been trying to avoid, but the fact is that ANT-MAN is a perfectly good movie. But it could have been great. It’s not the fault of director Peyton Reed, or the fault of the often hilarious script by Edgar Wright, Joe Cornish, Paul Rudd, and Adam McKay (and I’ll get a little more into the tumultuous behind-the-scenes wrangling a little bit later), as far as I can tell. AVENGERS: AGE OF ULTRON has the same problem that ANT-MAN has, to a larger degree – too much of the film feels like Marvel’s checking off entries to a list, and not allowing the film to breathe on its own instead of making sure it fits precisely where it needs to in the Marvel Cinematic Universe. Granted, for ANT-MAN, it’s more of an annoyance than anything. But while I appreciate and admire the scope of what Marvel is doing, which frankly hasn’t been attempted at this extent before, it can lead to a frustrating filmgoing experience when you can sense how much the movie wants to break away and do its own thing. As Marvel expands and builds upon its Cinematic Universe, we get to explore interesting corners that we haven’t seen before now. It’s here that we meet Hank Pym (Michael Douglas), discoverer of the Pym Particle, which allows molecules to drastically reduce the space between atoms while still keeping its intrinsic form and their kinetic energy and motion. In the wrong hands, it could be a potentially dangerous weapon, and when Howard Stark (John Slattery) tries to obtain it by taking over Pym’s company, Pym rebels and takes his ball home. Years later, Darren Cross (Corey Stoll), Pym’s once protégé, is days, maybe hours away from cracking Pym’s work. Pym doesn’t quite trust Cross’s intentions, so he plans to get Cross’s technology away from him. But for that he needs a thief – not just an excellent thief, but one with a kind heart and a good soul. Enter Scott Lang (Paul Rudd) – “I don’t rob. I burgle.” Scott’s got all the skills and more importantly, the compassion that Pym is looking for, but he’s struggling with trying to stay on the straight and narrow for his daughter’s sake. 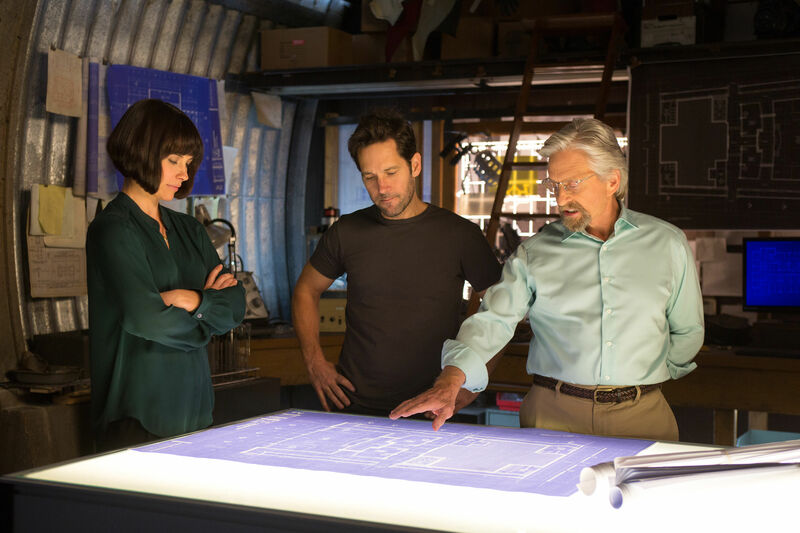 But Hank needs Scott, and with Scott’s help, and the help of Pym’s mostly estranged daughter Hope (Evangeline Lilly), Pym trains Scott how to use the Ant-Man suit’s shrinking ability. Tagging along are Lang’s friends Luis (Michael Peña), Kurt (David Dastmalchian), and Dave (Tip “T.I.” Harris), and with their help, Lang must pull off the ultimate heist. Darren Cross will stop at nothing in selling his Yellowjacket tech for nefarious purposes, and if he can get back at the mentor who abandoned him, all the better. The scale of ANT-MAN may be smaller than other entries in the MCU, but the stakes are just as high. 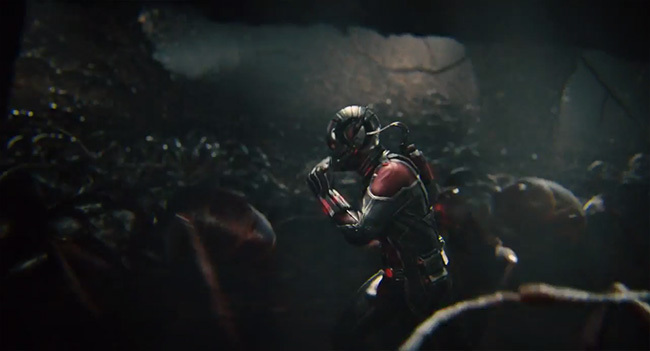 I love the look of ANT-MAN, and this is the first Marvel film where it feels like the 3D is essential. When Ant-Man shrinks down, the 3D helps accentuate the transformation and it all looks visually impressive, especially on an IMAX screen. 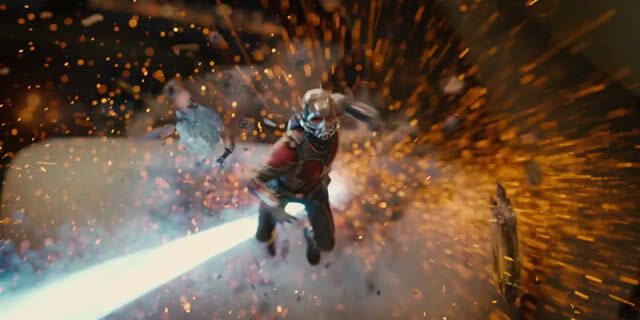 When Scott runs with the ants, or piggybacks on a flying ant, it really pays off visually, but Reed, the work of cinematographer Russell Carpenter, and the team of special effects artists, give ANT-MAN an energy and whimsy that we haven’t seen in these movies since the first AVENGERS film. There are a lot of cool moments in ANT-MAN, and the humor makes everything work. One sequence, at the Avengers’ new compound, is one of my favorite MCU moments so far, and ANT-MAN fits organically with the rest of the films in a refreshing way. So where does the trouble come into paradise? Frankly, Marvel needs to get away from the template that we’ve seen in these films so far. There’s always a MacGuffin that the heroes need to retrieve, or keep away from the bad guys, or both. That may be true for the entire superhero genre at this point, and while ANT-MAN is busy establishing a character and placing a piece into the larger puzzle, the film is at its best when it breaks free of that larger pattern. Perhaps it’s due to the fact that ANT-MAN has many cooks stirring the pot, and that the disagreements of those cooks were aired out in a very public way. But all the Marvel films have that to some degree. Marvel isn’t fighting with the tone and the skillset of the directors they’ve hired. Instead, the directors are fighting with the big picture that Marvel has painted for itself, and these filmmakers are struggling in trying to establish their own rhythm and voice amongst all the worldbuilding. Marvel seems to want all the luster of the directors they hire, but muzzles those aspects that make them unique and original. Whatever movie Edgar Wright was going to make, that isn’t the movie that has been released, and I’m not reviewing the film that could have been. Frankly, I think comparisons are unfair to Peyton Reed, who is a wonderful director – funny, engaging, and energetic, and with an excellent track record, both in films and television. BRING IT ON is terrific. So is DOWN WITH LOVE. Both films do exactly what they intended to do. He has a keen eye and excellent comic pacing. ANT-MAN has some delightfully weird moments that work perfectly, but I couldn’t shake the idea that Reed would have been perfectly willing to go even further had Marvel not micromanaged the film as much as they did. I’m not privy to all the machinations behind the scenes, but there are times that ANT-MAN wants to break free of the Marvel mold so badly, and you can see the truly crazy, innovative film trying to escape. I think Reed is a big part of that, and I very much want to see a Marvel film with Peyton Reed at the helm, unencumbered from all the outside politics. He deserves that. Again, this may read as more negative than intended. Most of ANT-MAN is a blast, and both the post-credit sequences put well-earned exclamation points on the affair, especially the second one, which wraps up a dangling MCU storyline while firmly placing ANT-MAN into the rest of the franchise. ANT-MAN has a ton of personality and charisma. Marvel has the rest of these Phase Three films plotted out meticulously and thoroughly. Now it’s their job to figure out how to make it feel like it’s not all on rails.